After debating over the cat castle, I was feeling mentally exhausted by the prospect of purging, so I had a hard time deciding what to get rid of. 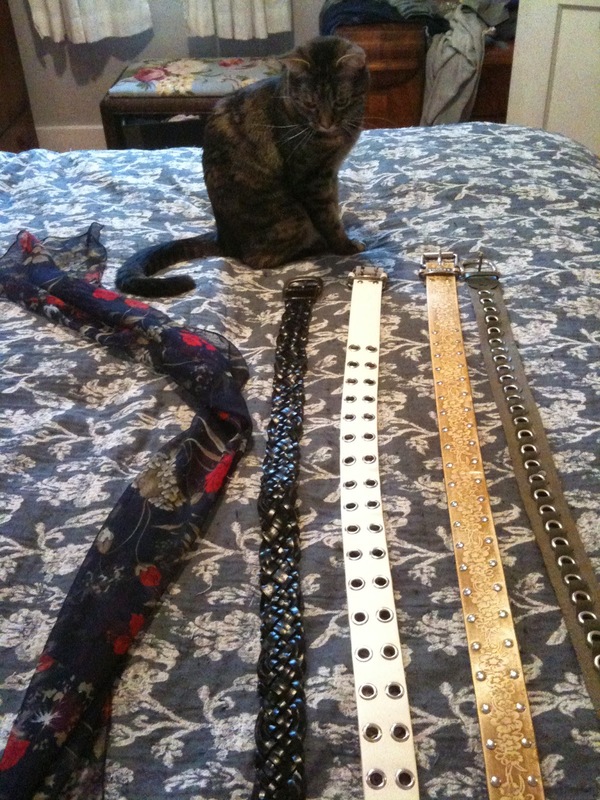 Ultimately I chose something easy, something I know I don't need or even really use: belts. I got rid of four belts that I've virtually never worn, leaving just one casual black belt "just in case." I also threw in a single scarf. I have other scarves that I like more, and I never even actually wear those very often, so I thought I'd start by getting rid of what I know I just don't like. This was the only one that actually fell into that category. These are also going into my Goodwill pile, which is steadily growing. I plan to go through everything in my closet, accumulate a pile of donations, and then take it all over at once. I'm finding some things are easy to get rid of, and other things are much harder. I'm sure it won't always be the case, but it seems like the bigger or more expensive the item is, the harder it feels like it is to part with it. I had a hard time deciding what to do with the cat castle, and giving it a final chance in a different location was the best I felt like I could do. But purging things like socks, purses, and belts is an easy decision to make! Eventually I know I will run out of small, easy items, but by that point I am hoping I will be so used to getting rid of things, and will have learned better how to assess what I do or don't want/need, that it will make it easier to get rid of things that right now seem too difficult.